Thirty years ago this week, Richard Branson entered the history books with the first successful transatlantic crossing in a hot air balloon. The intrepid entrepreneur set off from Maine, USA, on 2 July 1987. Along with his partner Per Lindstrand, Branson crossed 3,075 miles of open water during their record breaking feat. About 32 hours after take-off, it touched down momentarily just outside Limavady, County Londonderry. However, it was far from the planned arrival for which they had been hoping. In a documentary last year, the Virgin founder revealed that he feared for his life after the balloon was badly damaged and hurtled out of control as it crossed over Northern Ireland. "Just these horrible flashes going on," Branson explained. "The brain was desperately wanting to go to sleep and the body was desperately wanting to go to sleep but there was no way I was going to let it happen. "Suddenly I saw what looked like chunks of flame falling all around the top of the dome. "For a second I thought: 'I'm beginning to hallucinate out of tiredness' and then I realised 'we're on fire'. "You could see these lumps of burning snowballs falling around the dome, one lump of that propane hitting the dome would have exploded it." The stricken Virgin Atlantic Flyer descended from nearly 30,000 feet, scraped through a field and demolished a dry stone wall near Limavady, before swooping back into the air towards Rathlin Island. After a number of attempts to land, both pilots bailed out into the Atlantic and were later rescued by the Royal Navy. Cue a scrum by the world's media. One of the first to interview him, was BBC Radio Foyle's Mairead Devlin. "In those days we didn't have mobile phones, we didn't have sat navs, so when someone of the celebrity status of Richard Branson was dropping in, quite literally, everybody was sent all over the place," Ms Devlin said. "We all headed off in cars, rallying around the back roads, turning corners on two wheels because I had to keep up with the television crew. "I had the radio car and whoever the presenter was said to me: 'we're coming to you soon' and Richard Branson was going to head off with someone else so I had to hold on to him, grip hold off his arm and not let him away and we got the story." 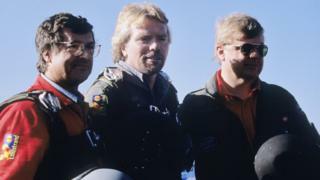 Surviving a high altitude battle with death is one thing, but how did Branson deal with the swarm of reporters? "He was utterly charming," Mairead remembers, "he was very thankful to all the rescue people. He just said that he really did think that it was over, it was curtains for him, and he was going to die. "He did promise that he would come back and see Northern Ireland properly, I'm just not sure if he did ever come back. "I'm sure he won't remember our interview but I'm sure he'll remember his very dramatic visit to Northern Ireland," she added. In the years to follow, Branson made several attempts to circumnavigate the globe but was eventually pipped to the post by the Breitling Orbiter, piloted by Bertrand Piccard and Brian Jones, in 1999. Despite that disappointment, Branson is surely glad that his 'brush' with a field in Limavady, was enough to put him in the record books.